The new landmark project – Geyser, designed by Andrew Patterson of Patterson Associates and owned by Samson Corporation, is the first in the country to ever receive six stars in a Green Star rating. Geysers’ floor plates are divided into five individual sub-buildings set around a system of atriums with pedestrian linkages. This maximises natural daylight penetration into, and exterior views out from, the majority of the spaces. 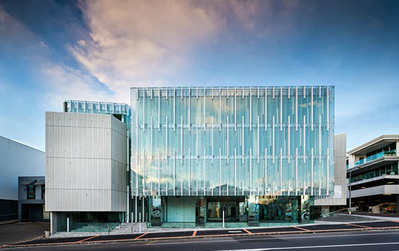 Each sub-building is wrapped in a dynamic 3-dimensional semi-reflective white twin walled façade. This technology creates natural heating and cooling ventilation by way of thermal currents rising up through the void spaces between the two walls providing natural comfort to tenants. CMS Electracom is delighted to have been involved in this landmark project in the design and supply of custom floorbox solutions, and softwiring products. CMS always produce with the environment in mind – CMS Electracom supports the ongoing program of environmental improvement outlined in the PVC industry’s Product Stewardship Program.